Step onto the lively promenade with a smile and discover the various cuisines and enjoyment to be had on this fun coastal resort. 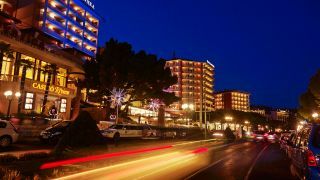 Portorož won over many hearts with its rich hotel selection and the echoing pulse of its nightlife. Allow its tempting, dynamic and sunny personality to take you over. Welcome to Portorož. 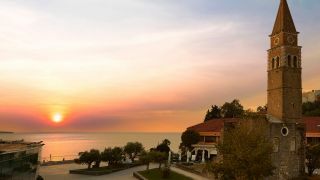 Where to stay in Portorož? Pleasant hospitality of Portorož offers a number of accommodation options. Choose yours. Spend your day exploring attractions which give the town its heart and soul. 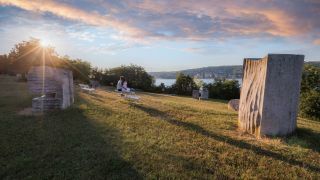 The open air sculpture exhibition. The monastery and the church date back to the 15th century. 550m long tunnel that connects Strunjan and Portorož. 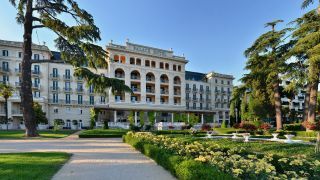 The Palace Hotel, an important milestone in the development of tourism in Portorož, first opened on the 20th of August, 1910. 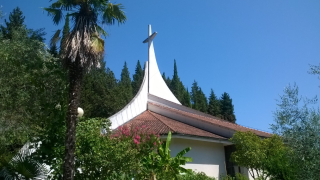 It’s a modern building, boasting a cross and a roof profile that are reminiscent of a ship and its mast. Relax at wellness by the sea, absorb the positive energy offered by the negative sea ions, feed your senses with the renowned culinary treats on offer, and end your day watching the relaxing sunset at one of the numerous piers. Discover everything this playful town has to offer. Relax and allow yourself a little bit of pleasure! Discover your new sea passion! Portorož is known as a town of fun and full of seaside joy. It should be noted, however, that this Slovenian hidden gem has more to it than meets the eye. Portorož has shaped its reputation as a place of healing since the 13th century. Aviation also plays a role in Portorož's history as it contributed towards expanding the tourism possibilities in the last century.